ADI is urging movie goers to boycott the film ‘Rust and Bone’ – which opened in the UK on 2 November and hits cinema screens in the US on Friday, 16 November – over its promotion and needless use of captive orcas. Keeping whales and dolphins in captivity is becoming increasingly unpopular as the public become educated to the wretched existence these animals have to endure; in the UK shows featuring performing cetaceans have already ended due to public opposition and unease. In ‘Rust and Bone’, Marion Cotillard, who plays the female lead, works as a killer whale trainer, with some of the scenes for the film reportedly being filmed at Marineland Antibes in France which currently has five captive orcas, including one which was captured and taken from the wild in 1982. In the wild, orcas live in close-knit pods consisting of their extended family, often for their entire lives, resulting in incredibly strong, long-term social bonds. Females typically live to 50 years of age, with some living as long as 90 years or more, and males living to 30 years of age on average, but also as long as 60 years. In captivity, orcas are separated from family and social groups and this, together with the confined space they are forced to live in and the wholly unnatural existence they suffer, can lead to stereotypical and other very abnormal behaviours, including aggression. Their lifespan, unsurprisingly, is significantly reduced, with most captive orcas dying before they reach their early 20s. In addition to the serious welfare concerns that have been raised by experienced scientists, researchers and animal protection groups, specifically pertaining to orcas, there are also concerns about human safety. Those working with orcas can risk injury and even death on a daily basis – such as the tragedy at SeaWorld Orlando in 2010 when experienced trainer Dawn Brancheau was killed by Tilikum, an orca who had previously been involved in the deaths of two other people. ADI is dismayed that the director Jacques Audiard gave his approval to the incarceration of orcas by using performing animals in the film. We urge him to voice his opposition to the captive cetacean industry and pledge to use CGI and other technologies for future productions. Boycott ‘Rust and Bone’ and encourage others to do so – why not write to your local paper to let others know about the cruelty involved? 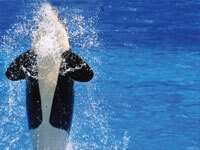 Pledge not to visit establishments that use captive whales and dolphins for entertainment.